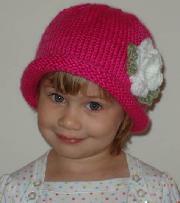 There is some variation in the finished size of these handmade hats that depends on the type of yarn and needles used. It is small by comparison to the considerable variation in head size. My 3 year old granddaughter's head is smaller than my 2 year old granddaughter's head and the 2 year old's head is about the same size as my 4 year old granddaughter's head! The best way to determine hat size is to measure the circumference of the head by putting a tape measure around the head above the eyes before ordering. If you can't do this, please refer to the standard age range below to select the size. 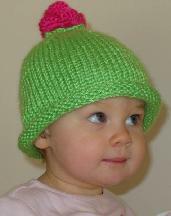 The good news is that hand-knit hats stretch at least a couple of inches, and only few children need a 20 inch hat. The bigger the hat, the more it stretches. In general you want a hat to be an inch or two smaller than the head. The three granddaughters I mentioned above have heads that range from 18 1/2 to 19 3/4 inches in circumference. They all wear Toddler hats as does my 17 month old granddaughter whose 17 inch head is now too big for her baby hats. If a baby is more than 6 months old, I'd suggest you consider the toddler size so that he or she can wear it for a few years.